Can a hedgehog ride a horse? Though many are still processing the raw emotions that comes with such an alliance, Mario and Sonic are friends now: Mario and Sonic at the Olympic Winter Games and its summery counterpart Mario and Sonic at the Olympic Games showed the plumber and hedgehog could put aside their differences for the sake of sporty minigames and making everyone lots of money. 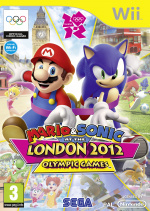 With approximately 438 days until the London 2012 Olympic Games kick off, SEGA has revealed the first screenshots and details of the upcoming Mario and Sonic at the London 2012 Olympic Games, which may induce WTFing. From Sonic — a hedgehog, remember — riding a horse to Mario flying a giant discus around Sonic Adventure's Windy Valley stage, the game looks set to combine the usual 'serious' athletic disciplines with the Dream Events that bring both series' more outrageous elements to the table. The Dream Long Jump is a perfect example, where Sonic, Tails, Mario, Bowser and more leap through a Yoshi's Story-esque world, bouncing on clouds to see who can get the furthest. It's the closest we're likely to get to a New Super Mario Bros. Wii-style adventure starring the plumber's blue rival. 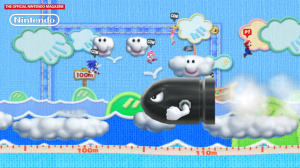 The 3DS version boasts some equally odd events, including the Race Walk, where players must not harness Sonic's legendary speed. The mind boggles. Official Nintendo Magazine UK has more details. I got bored of the first one very quickly. I'd rather they made a mario & sonic platformer crossover. I admit it. My mind is genuinely blown. Gargantu-WIN? Maybe, we'll see. It makes sense since Sega has really been trying lately to make Sonic good. Cloud Hopping is my favorite Olympic event. Sonic and Mario should never have got in bed together...two different worlds. Never did play those games though. Mario needs to stop slumming with Sonic. Mario and Sonic's Epic Yarn? I guess it resembles Epic Yarn too but Kirby doesn't even appear in this game, so it's much more logical to see it as Yoshi's Story style! They need to make a Mario & Sonic crossover platformer, not another stupid olympic game. That's cool to see them in Yoshi Story. Alright you've finally lost it, guys. I was gonna say it looks like Epic Yarn, but then I noticed from the comments that it's from Yoshi's Story. Looks pretty good. @RYBlast It does look a lot like epic yarn. Too bad, I was really hoping for a playable kirby. Anyone with eyes can tell, it's Kirby's Epic Yarn. ....But I probably still don't buy it anyway! Race walk? Where have I seen this before? No more!!!!!! Please Sega, if you're going to make a game starring the two biggest mascots of all time, at least make it appealing to the fans (not this kiddy shovelware minigame garbage the Wii is famous for). Seeing how you all didn't post the screenshot with Mario riding the horse, here it is. That Screenshot looks strange enough on its own and the article of Official Nintendo Magazine mentioned on the NL article mentionsh an even stranger scenario. Yoshi riding a horse will look even more unusual. Now just imagine Mario riding Yoshi riding a horse. then I was like "auwwww"
Already pre-ordered the wii version. Of the 75 or so Wii games I've played, the Mario and Sonic series comes into my top 12-15. No pap. I need a revw for the 3ds version as the ONM hands on playtest said the events had been reduced from the midi-game format to the mini-game format - but they only played a handful of the 50 events on the 3DS. Its been four years since the last olympics and two years since the winter olympics - what's wrong with a Mario and Sonic Olympics game to coincide with the games. The Winter games iteration scored a 9/10 for the Wii version from the reliable NL reviewers as well and I would personally rate the first one as 9/10. Also, my folks bought the ds versions of both games for my oldest son and that was a hoot as much as the Wii versions were. Think people need to cut this UNDERRATED series a bit of slack and just have some fun. at least it got me curious how this game will be. but dont count on me to pre-order or buy at launch. They did Kirby Epic Yarn style, that's cool! Nooooooot agaaiin! Whyy Nintendo, whyyyy? I'm happy to see this. Though I would prefer a full-on New Super Mario/Sonic 4 style sidescroller now that they put the idea in my head. ^ Who does Mario think he is with that horse? Link? But hey this game is looking a lot better than the others. LOL the screenshot looks like they simply dumped some Sonic chararacters into New Super Mario Brothers Wii coop. #34 said, "I want to see Bowser ride a horse." XD He'd freekin' crush it!